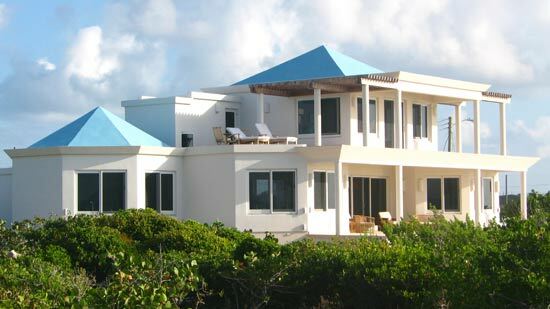 Mike, Toby and the rest of the TurnKey team have finished up our Anguilla home, the Caribbean pool, last touches, and all. 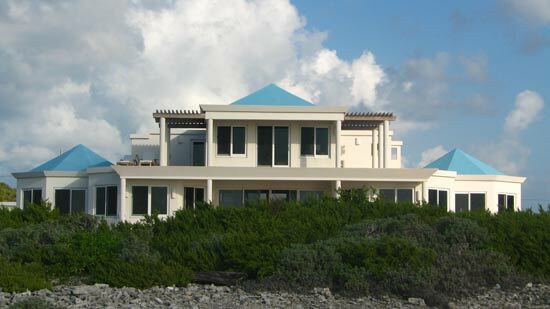 Welcome To Our Anguilla Home! 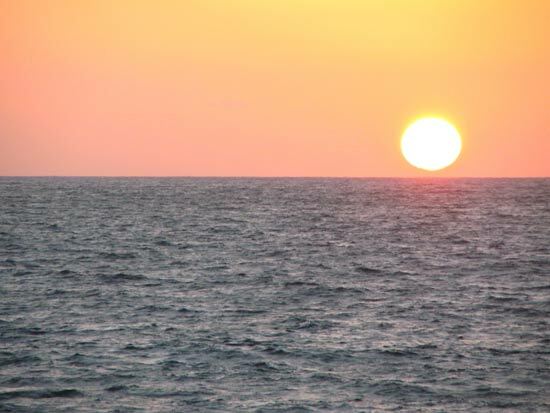 Our home overlooks the Caribbean Sea with southerly views to St. Martin (westward), St. Barths and Tintamarre, St. Martin (due south) and the open Caribbean with magnificent sunrises (eastward). We decided on the exact position and orientation of our home after Ken spent many days on the land. He put ribbons on stakes noting the direction of the winds at different times. We also did software sun studies to see how the sun plays across the sky at different times of the day, and during different months of the year. All of this information gave us the best position of the house and pool, taking maximal advantage of the sun and tropical trades. The house itself is amazingly cool. It was built using Insulated Concrete forms, ICF. This method of construction insulates the concrete from the sun, so the walls and roof never radiate heat back into our home. The home is built in a series of octagons. 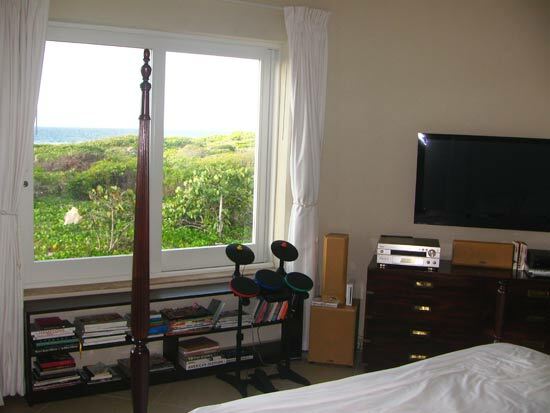 So sea-facing windows capture the trades whether from the east (usual) or the south or west. Even in the winter, when the breeze often comes out of the north, we open various windows so constant have cooling breeze in our home. 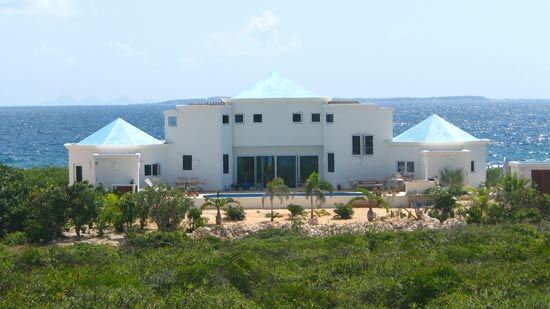 While the octagons overlook the sea, large sliding-doors in the breezeway (center of the house) open up to the pool (in the back) and the Caribbean (in the front). We almost never use the air conditioners. 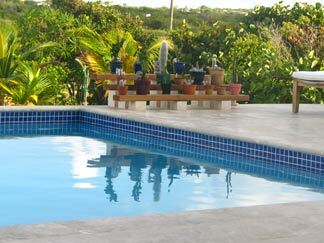 We placed the swimming pool behind the house so it is protected from the cooling evaporation of steady trade winds in our part of Anguilla, with the sun keeping it warm. In the back, the pool is the center of a sheltered oasis. If it had been in the front, the trades would made the pool too cool, swimmers too shivery, and BBQs too air-borne! 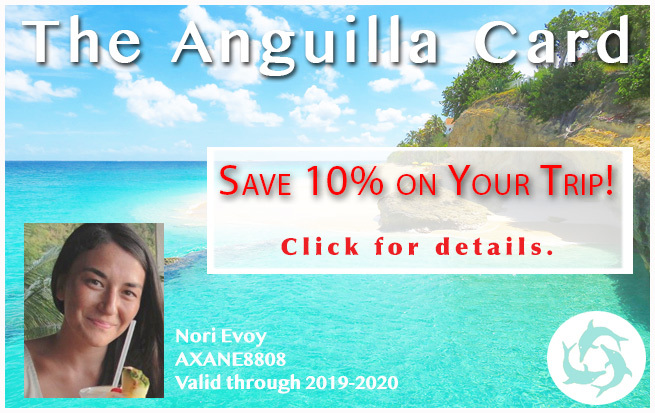 Water is at a premium in Anguilla. Each roof surface collects rainwater, funneling it into two cisterns, one for home use and one for gardening. The top floor patio collects water used for watering our plants, an important reservoir in an island where rain is rare. We started our landscaping by using the natural vegetation. 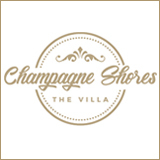 It is already established, so we know that it does well in the salty, breezy seafront. We cleaned out dead or boring brush, saving such native plants as sensational frangipanis and loblollies that would have taken 20+ years to grow. 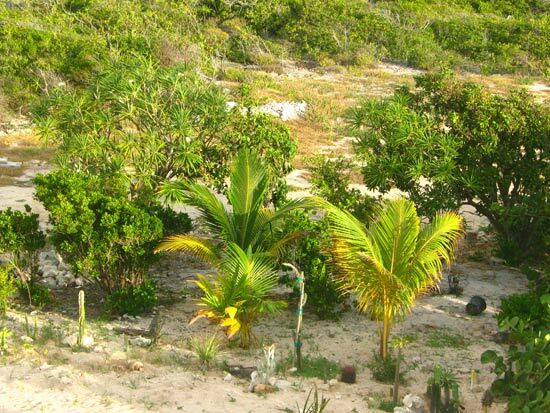 We have started planting some palms, cycads and many cacti (more on the cacti later). Ken loves doing this, figuring out what will do well in various micro-climates around our home (dramatic differences between windward and leeward, sun or shade, sheltered or exposed). The irrigation system is in place. So the "canvas" awaits. In the coming years, we will slowly "paint" the land with exciting plants as the mood strikes. Now that you have the lay of the land, let's start the tour. We'll begin with the kitchen! The home itself was designed by Ken and Yuki initially. 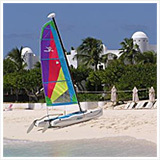 They involved draftsmen from Montreal and then Anguilla and finally a local engineer. I remember Ken and Mike building it to "way above spec," wanting it to withstand whatever Mother Nature throws at us. Many of the home's details were improvised as construction advanced. As Toby says, "You can see so much much more when you actually stand in it." 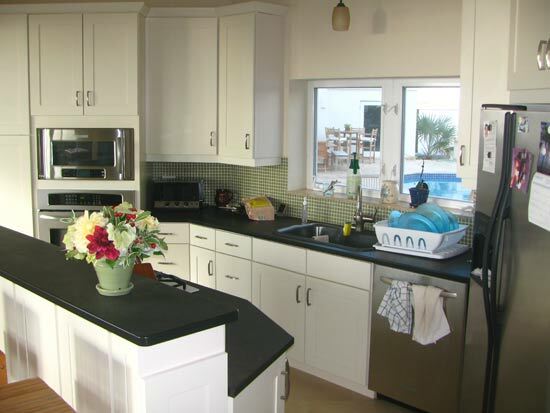 For example, the idea of raising a countertop above the level of the kitchen island came from Toby and Mike. It delivered a wonderful informal dining space. They also organized the placement of appliances and cupboards. The kitchen is roomy and has lots of work and storage space. The bar style table and high chairs on the other side of the kitchen saves space and is a comfortable way to dine as a family too. Additional counter space and built-in cupboards were another great idea and filled in an otherwise empty wall while not taking up much room. The kitchen also opens to a mud-room via a pocket door (not shown) for laundry, etc. The kitchen windows either look out, over the sink, to the pool or (on the other side) to the southeast and the open Caribbean, making it a very pleasant spot to have an indoor meal. 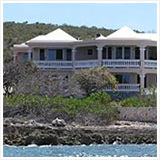 Our home was designed in the "open plan" style of most Anguilla homes. 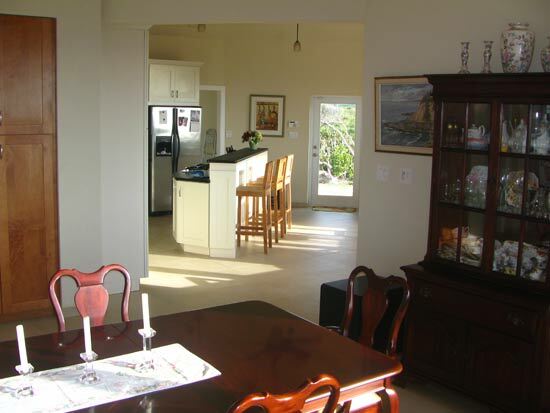 The dining room (on the left) has three large windows. As explained, this is true for every room on the first floor. 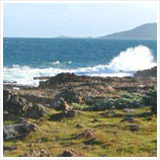 It gives the sensation of three "snapshots"... one of St. Martin, one of St. Barths, and one of the open Caribbean. We brought the various pieces of our dining set from Montreal, so it's Canadian in style, not Caribbean. I loved this set and we like the continuity of the furniture we brought. 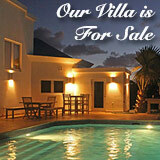 The nice part of living in your Anguilla home and not renting it is that you can live in it. The built-in cupboards (right) give the area a simple, clean and open look. But the storage space is tremendous and easily accessed. The breezeway sits between the front and back of the house, between the east and west halves. It provides the best cross breezes. 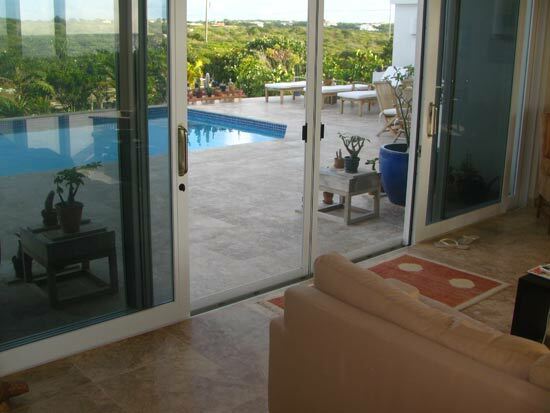 Sitting in the breezeway surrounds you with water, pool to one side, Caribbean to the other. 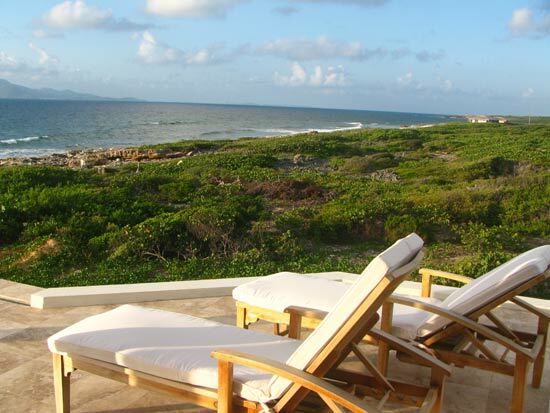 From the pool, we can look through the house to see and hear the Caribbean, keeping the sensation of continuity. 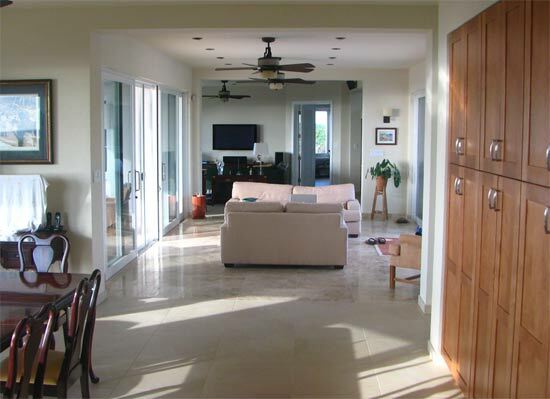 The flooring of the breezeway was laid in Anguilla Limestone. 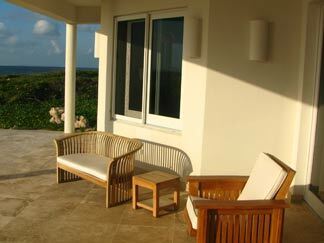 The front and back patios are also out of Anguilla stone. This pull the outside in, and the inside out, flowing as one. 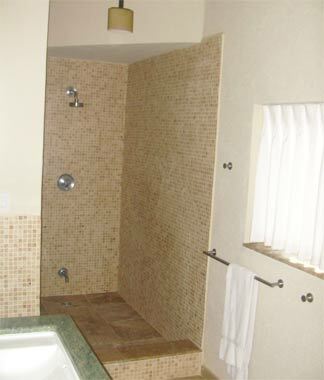 We have a full sized bathroom with shower and bath. 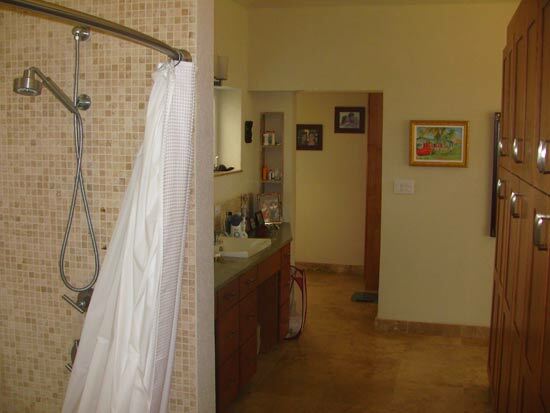 It serves as a guest powder room. 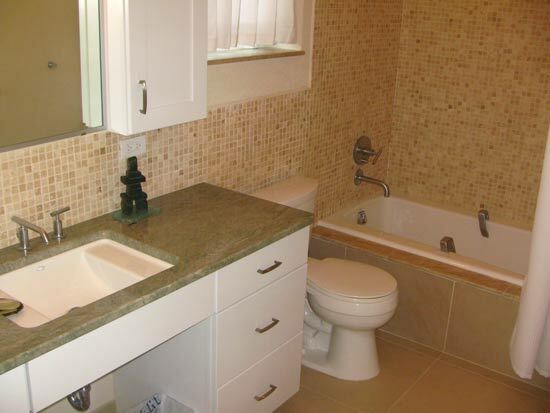 The countertops are granite with Anguilla limestone edging the bathtub. There are maple cabinets on both sides of the mirror, the same material and style as the kitchen with lots of drawer space as well. 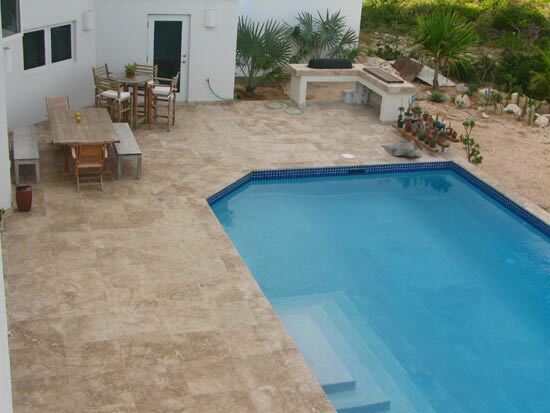 The Anguilla limestone tiles have an unusual "soft," smooth feel to the bare foot. It can range in color from a darker coffee to pink! When all the windows in the house are closed it is virtually air-tight and sound proof. Not even the whistling of the wind can be heard. These are really solid windows. 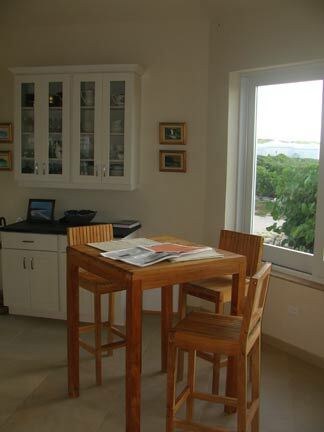 The countertop is Anguilla limestone, inset with a breadboard and barbeque. Anguillians make their barbeques from old propane gas cylinders. But the cylinder is cut in half and contains charcoal, not propane. So the food has that genuine charcoal BBQ flavor. 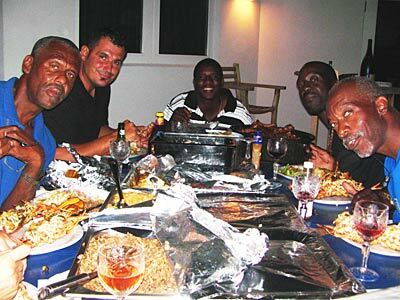 Our first barbeque was with the Mike Toby and theTurnKey crew. A huge success... and delicious! A teak carved sea turtle watches over the pool along with some interesting cacti, a hobby of Ken's. He grows smaller ones in pots until they're ready to become part of the landscaping. The Caribbean pool was sealed with Diamond Brite. 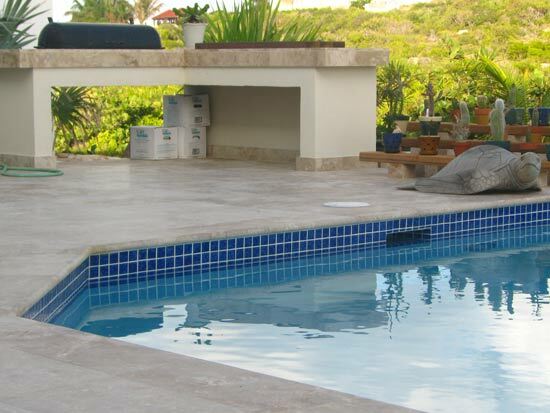 It's a tough seal and once the pool is filled, the water reflects a color that matches the Caribbean Sea. The Anguilla limestone was honed five times. Due to the nature of limestone, it does not become "slippery when wet." So it looks very "finished" while still being safe. As I mentioned, Ken loves cactus collecting. He used to have 500 in a greenhouse in Montreal. Now he can keep them outdoors! He displays them on shelves until he can "set them free" in the ground. 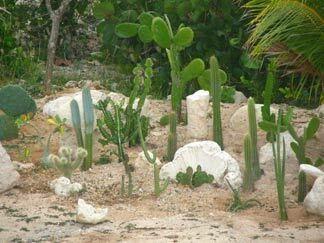 The desert like climate of Anguilla is perfect for growing these interesting and strange looking plants. They are tough-skinned so, it turns out, salt-resistant. With low rainfall, plenty of sun and hear, they thrive. This is just a small part of what is already in the ground. I hesitate to think of what it will be like in a few years! This is the south facing patio at the front of the house. It's a comfortable place to read, do some computer work or just have a cat nap. The overhang from the second floor protects it from rain and some sun. The patio is open beyond the pillars, but it's shaded when the sun is hottest, for comfortable outdoors seating. In earlier morning and later afternoon, it allows the sun back in. 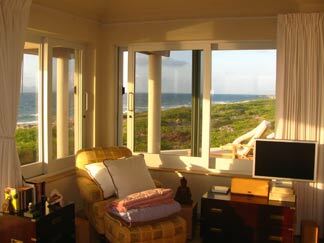 This room has, like the others, windows that face in three directions, taking advantage of various breezes and views. The octagonal structure really works well. When it rains we can even leave at least one window open! The family room is comfortable, with lots of space for everyone to read, sit around and chat, or enjoy a movie or some television. How cool is the home? 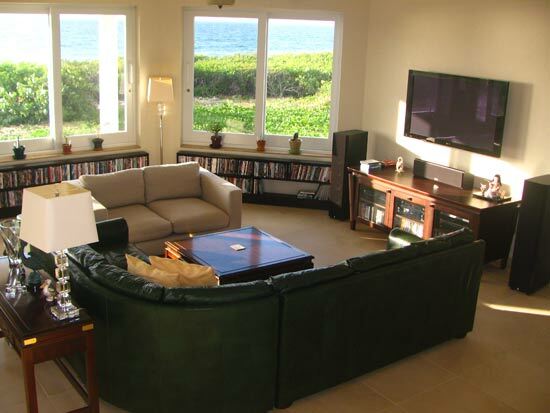 Well, you won't see many leather sofas in Anguilla, not without a lot of air-conditioning! The shelves were custom-made out of mahogany by a local carpenter, Nick Proctor. He sized them perfectly to accommodate CDs and DVDs. The ground floor bedroom has a view of the lights of St. Martin at night as they twinkle through the windows like diamonds. Large, built-in cupboards, similar to those in dining room, leave the room open and clean-looking. An open-at-the-top dividing wall behind the bed allows for ventilation. Nick Proctor built a charming set of bedside tables (not shown) and matched the book shelf color to the mahogany furniture. You can tell this is the girls' room -- a little Band Hero, anyone? A pocket sliding door closes off the bathroom which has a large shower, extensive cupboards again, marble-topped counter and the other usual necessities. One of my favorite aspects of our home is "no wasted space." We used to live in one home, where the girls were brought up, with several rooms we never used. We vowed we would never do that again. We use every square inch. And that includes a work area tucked under the staircase that winds up to the second floor. 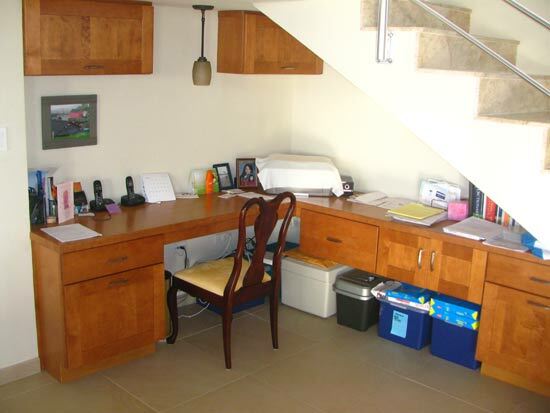 Custom-built, this area gives us all the functionality of our larger home office back home, yet is tucked conveniently "out of the way." This, too, was a thought that developed during construction. 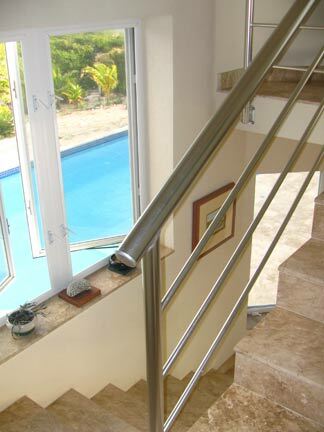 Windows overlook the pool, brightening the stairway. The aluminum railings are rust-proof (something we've been careful to incorporate throughout) with a somewhat nautical feel. As you round the staircase, another "terrace-level" window gives you a wonderful view across the patio and out over to St. Barths and Tintamarre. This, too, was an "on the fly" decision. Ken thought that the eye would enjoy that view while coming up the stairs and he was right. It grabs the eye and gives a picture frame feeling each time we go past it, even though you don't get the full effect from this photo on a hazy day. The master bedroom is to the right of the bank of cupboards and closets on the right (open at the top for ventilation). The cupboards act as a dressing room wall, giving us lots of storage space for clothes, etc. The marble countertop has "his and hers" sink (you can only see "his" here). We used Anguilla limestone to make shelves beside the counter and as well in the bathtub area. The windows to the left overlook the pool. 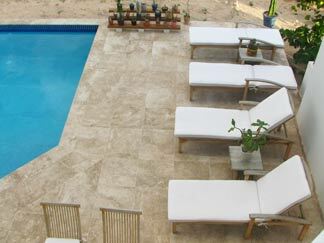 This view of the pool patio from the upstairs bathroom shows the interesting coloration and nice finish of the Anguilla limestone. If you look carefully, you can see that the pool has three depths. The pool's greatest depth is farthest away, running along the entire length, allowing one to dive in from either end and to swim laps without being bothered by a "shallow end." The shallowest depth is nearest the house, again running the length of the pool. On hot days I love sitting on the steps, reading a book. An intermediate depth runs between the other two. It was something Ken wanted to do, to make laps easier to swim, and it works extremely well. The outdoor shower was a fun addition. It's a great place for a quick cool down if you are sunning on the second floor patio. The window looks out to St.Barths, but you can't see it here. Volcanic ash from Montserrat cutting visibility to St. Barths on the day this picture was taken. 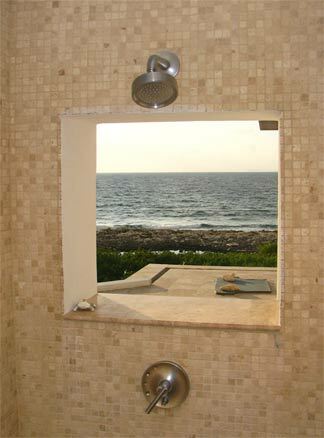 The Anguilla stone tiles are the same as used in all the bathrooms, and on throughout the entire second floor, both indoors and out (you can just spy them through the outdoor shower window, along with an exercise mat). The tiles on the second floor are 18", though, instead of 24". Otherwise, they are polished and finished identically. With windows on all three sides of the room there is also no lack of breeze. 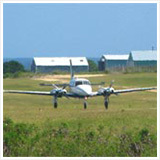 They provide a 200 degree view of St. Martin, St. Barths and on a clear day, St.Kitts/Nevis. 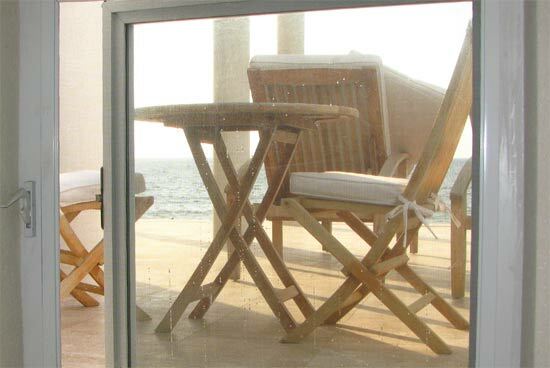 Sliding doors on the sea-side provide floor-to-ceiling views. In February and March, whales make their way through the channel. We have been fortunate enough to see them feed and frolicking. Our tropical building's pergolas give us nice protection from the highest heat of the sun, while still allowing bright light to enter the room. 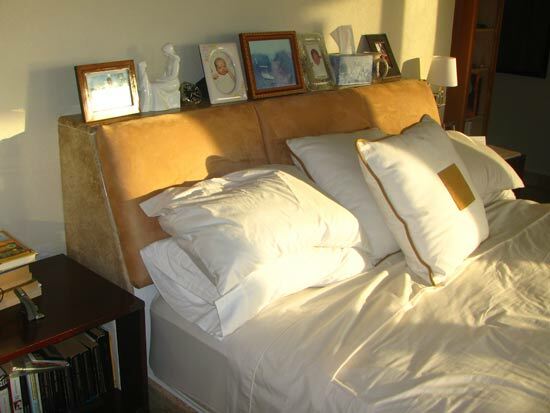 The bed sits on a concrete pedestal (invisible, which makes the mattress appear to float). You can tuck shoes and other items under this "footspace" which also makes it easy to approach the bed without your feet jamming against a frame. Sorry about the wrinkles. Ken took the photos while I was in New York! This room and the bed are simply a wonderful way to fall asleep, and to awake. The natural evergreen vegetation offers protection from the salt-bearing trades and gives the house some privacy and color without obstructing our views. You can see exactly how much window facing the home provides. The lighting and ventilation, as a result, is a major part of the experience of living here. No wasted space, ever nook and canny has a purpose. We're just too busy to have done this without having been comfortable placing our trust in Toby, Mike and the rest of the team at TurnKey Construction. They have built us a home with intense attention to detail and getting it right. 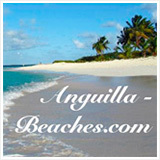 We thank them from the bottom of our hearts for our unique and beautiful home on our most cherished island, Anguilla. Next Step? 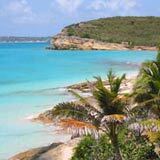 Thoughts after living in our Anguilla home for one year. 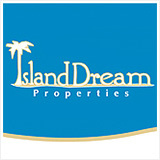 Contact Mike & Toby at TurnKey Construction to build your tropical home. 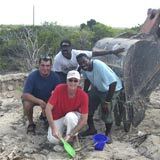 We love the whole team dearly and want to see them succeed in their Anguilla-home building venture. I can't recommend them highly enough.